Chris Bailey might be the most productive man you’d ever hope to meet. At least, that’s his goal. In May of this year, he committed to a year-long project in which he would do anything and everything to make his life more efficient. So far, that has included living in isolation, only using his smartphone for an hour a day, and getting up at 5:30am every morning. Most recently, he decided to watch 70 hours of TED Talks in 7 days. Yes, in the span of a week, Bailey watched 296 talks, beginning with Meg Jay’s “Why 30 is not the new 20,” ending with Eric Berlow and Sean Gourley’s “Mapping ideas worth spreading” and taking meticulous notes on everything in between. In the end, he compiled very efficient lists of 100 things he learned, the 7 characteristics of highly effective TED speakers and 10 talks to make you more productive. We had to hear more. So we called Bailey at home to talk more about why he values productivity so highly — and what it was like to watch so many freaking TED Talks in one go. Below, an edited version of our conversation. What prompted your year of productivity experiments? I graduated on May 1st with a business degree and, while I had two job offers, I thought, “If there’s a time when I can do this project, it’s now.” So between school and work, I am taking a one-year sabbatical to just devour everything I can get my hands on about productivity and write about it. Would you say that you’re a naturally productive person? Or is it something that you’ve had to train in yourself? I think it’s more natural than anything. I’m not sure if this is a good thing, but I always feel a little bit guilty when I’m not using my time the best that I can. The way time works, you have 24 drops of it every day so you might as well make the best of them. No matter what you do, there is a cost to it. If you’re spending time with the love of your life, that’s very valuable time but it’s also time when you’re not helping the world. You have to make choices. I really do subscribe to the philosophy, “Why do anything if you’re not going to do it right?” I take that to the work that I do, to school when I was in it, and now to A Year of Productivity. Why do you think the concept of productivity resonates with people? I’m thinking of the phrase “productive member of society,” or “fitter, happier, more productive” from Radiohead’s OK Computer. Why is the idea of accomplishing things in a short amount of time so appealing? It’s very much a part of our cultural vernacular, and I think rightfully so. We live in a very fast-paced world, and getting more done in a shorter amount of time is what most people want to do. But I think, increasingly, people have varying definitions of productivity. Some people might see it as getting as much out of the time that they have as they can. Some people might see it as getting more done in less time. And some people might see productivity as being able to work for six hours instead of 10, and then having more energy and time to spend with friends and family. I think what makes the concept so appealing is people can project onto productivity what means the most to them. People have different values, different priorities, and depending on those, they can mold their definition and interpret productivity to fit who they are. Which was harder for you: living in seclusion for 10 days, or using your smartphone for only an hour a day for three months? I’m on my smartphone all day long — it’s glued to my pocket, it’s another appendage, it’s attached to my hip. So that was kind of a reprogramming of my life, in a way. The smartphone experiment was longer, but I think on the whole, the difficulty of that experiment was spread out over the three months while the difficulty of living in reclusion was very concentrated. The good part about the reclusion experiment was that I knew there was an end in sight. Whatever happened, however my mood changed throughout the course of the experiment, I could always tell myself, “Okay, I only have five more days of this to go.” It was very emotionally draining, partly because I had no social interactions during the experiment and partly because I had no exposure to sunlight. How do you set goals and targets for yourself with your experiments? Ten days of seclusion sounds like a lot to me! I wanted to do an amount of time that pushed my limits. When I design an experiment, I want to make sure that it is not so completely outside of my comfort zone that I panic when I think about it, but that I also won’t be comfortable. So I play with different lengths of time. Ten days is a nice even number. A lot of my experiments are for seven days, which is of course a week. They’re both numbers that everybody can understand. Because not only do I have to do these experiments — I want people to read about them when I’m done. When it’s a nice round number, I think that makes it a lot easier for me to digest it, as well as for me to write about it. So me using my smartphone for an hour a day for three months — that’s a quarter of a year. I’m also working on an experiment where I’m reducing my body fat from 17% to 10%, while gaining 10 pounds of lean muscle mass. 10 pounds of lean muscle mass — that’s a number that a lot of bodybuilders aspire to gain. It’s a lot. It’s a goal that’s out of my comfort zone, but not into my panic zone. Why did you decide to do an experiment with TED Talks? Well, I love TED Talks. Every week, I go through a couple hours worth of talks to see what’s new. I love being inspired by interesting people, as well as by their ideas. I wanted to surround myself completely in the feeling of TED for one week, and see, “What characteristics do the best speakers at TED have? 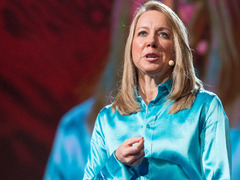 What characteristics do the best TED Talks have?” My thought was: this is where some of the most fascinating people from all around the world gather together, and I want to immerse myself in it as a productivity experiment. But my project is a year of productivity, so I wanted to spin it to be more about productivity. So I experimented with information retention and my energy levels and my focus, through taking breaks, through consuming different amounts of caffeine, and through my meditation practice, to be mindful of how these things affected one another. In all, you watched 296 talks? How did you pick talks? Some you watched are kind of obscure. A quarter of the talks I watched were submitted by readers. Before I set out on this one-week adventure, I put out a call and asked, “Do you have any TED Talks that inspired you, or changed your game, or motivated you, or made you more productive?” I got about two days worth of talks that way. After that, I ignored the homepage and searched for topics like sleep and motivation, and I found a lot of fantastic playlists. There’s ants, there’s journalism, there’s the Middle East, there’s piano TED Talks. Any kind of talk that you can imagine, chances are it’s in a list. I think picking a TED Talk is like picking a song — you really can find one for every mood. Meg Jay: Why 30 is not the new 20 The first talk you watched was Meg Jay on making the most of your 20s. I thought that was such an interesting choice for the first talk. How did you decide on that one? That was actually just the first talk that someone submitted. But it was meaningful for me, because it kind of confirmed the attitude that I have about my 20s. I’m 23, and this talk really struck a chord with the way I work and think, in that, you shouldn’t waste time. Time is a terrible thing to waste or just burn through, especially right off. And so that talk really connected with me. What are the three talks that stuck with you the most? The talks that really stuck out at me, out of the 300 talks that I watched, were the ones that moved me or that made me laugh. Every talk — some were dense with information, some were motivational, but what you remember are the talks that make you feel. Andrew Solomon: Love, no matter what Definitely “Love no matter what” by Andrew Solomon. It’s just a beautiful talk about the human condition and about acceptance. It was one of the most emotional talks — one of the most inspiring and warm talks — that I watched throughout the course of the experiment. 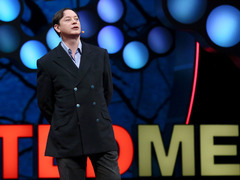 And Andrew Solomon’s presentation style is so not parallel to what he talks about. When he gets up on stage, you think, “This is going to be rigid, this is going to be a very formal talk.” But then all that kind of washes away, and what you’re left with is his message to love no matter what, to accept the people in your life no matter what, and that’s a message that struck a really strong chord with me. And the third talk: Benjamin Zander’s “The transformative power of classical music.” For a lot of people, including myself, I’ve been to a few classical musical concerts and I’ve enjoyed myself. It’s been calming, but I wasn’t able to connect with the music. He takes a topic that some people are afraid of — that some people misunderstand and other people push away — and he brings it down to earth. 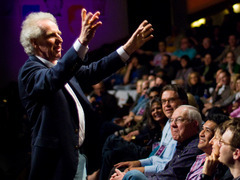 He really makes classical music your friend during his TED Talk, and that’s what I really enjoyed. In general, how would you say that you feel when you feel like you’re wasting time? It depends on if my intention was to waste time in the first place. If you intend to have a lazy afternoon and watch a marathon of Breaking Bad while you’re eating Ben & Jerry’s on the couch, and you do that, then I think you were productive, because it was your intention to do that. If I intend to waste time, I feel very, very productive. It’s if my actions don’t match up with I wanted to do that I don’t consider myself productive. What’s something that you should never apply the rules of productivity to? People. Being surrounded by people you love. But now that I say that, I really do think you should apply productivity to everything, even if it’s hanging out with people you love. You might just need to rework your definition of productivity a bit for that situation. Productivity, when you’re spending time with a loved one, might not mean getting the most done in the least amount of time. Productivity in a situation like that might be deeply investing in that relationship, so that the relationship compounds and provides you with even deeper rewards in the future. I think you should bring the attitude of productivity to everything that you do, especially when you have the right definition of productivity in the first place. I have the same interests as this amazing guy. I have got to explore his site and articles more. And I love TED talks as they are an orchestra of intellect, wisdom and creativity! A very nice article! Reblogged this on The Quest for an Abudance in Sunshine.